The Westminster Schools is embarking on an initiative in its Middle School to build a STEAM vision, mission, and curriculum. The School is also embarking on a 3,400 square foot renovation of existing Middle School space into an innovation lab/maker space to support this curricular initiative. To get this process off the ground we have a group of seven Middle School teachers who have formed a STEAM cohort that will meet regularly under the guidance of the Center for Teaching. This cohort will lay the groundwork for the STEAM curriculum. A separate Design Team of Middle School teachers is working collaboratively with an architect to inform the design of the innovation lab. Our goal is to have a curriculum ready for 2015-2016 and the innovation lab ready for occupancy in August 2015. As part of this overall work, our 8th Grade Physical Science students are ramping up the machines unit with a STEAM initiative. I introduced this unit using a wide variety of music videos featuring Rube Goldberg machines. 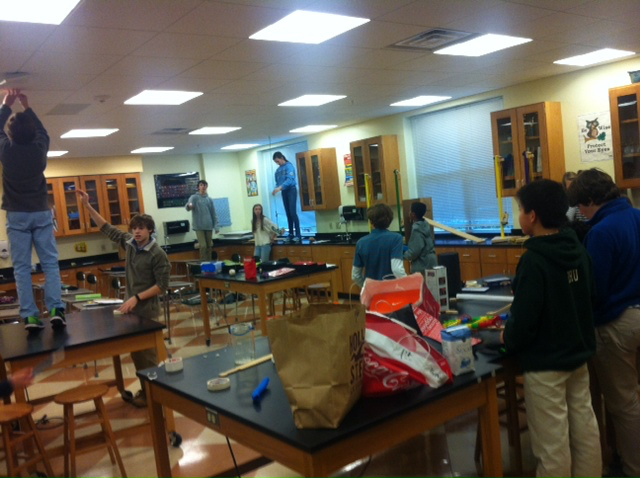 Immediately, students became excited and submerged in the development of their project to build a Rube Goldberg machine. Each student was tasked with contributing three items they wanted to use in the design. In teams, they created “sub-parts” of the machine using the design cycle of tinkering, testing and revising. Students assembled the subparts and learned the true meaning of trial-and-error. Student engineers found that embedded in the project was a generous amount of applied math. In a guided reflection, student wrote about what they learned with regard to taking risks, making mistakes and collaborating on teams. They discovered and applied their physics principles using different types of simple machines, experimenting with mechanical energy and advantage, and learning about conservation of energy in a system. Their work is leading towards a Rube Goldberg exhibit that will be part of our school-wide STEAM show in March 2015.
organization as a way to complete the learning cycle. In the meantime, students are completing performance-based assessments, using and redesigning simple machines to illustrate the scientific definitions of work, mechanical advantage and efficiency. These assessments are graded in the categories of lab skills, accurately using rulers and spring scales; diagrams, applying the vocabulary to free body diagrams; calculations, using the six new formulas of machines; and scientific writing, clearly explaining science concepts using evidence to support their understanding. In reflection, this transformation from a computational to conceptual approach to mechanics, along with the integration of a STEAM approach, has made a difficult unit a more rewarding unit for all of us because of the authentic level of engagement of my students. For more information about this work in our Middle School science program at The Westminster Schools contact meciaisrael@westminster.net.